Bobby Rivers TV: On CAN YOU EVER FORGIVE ME? When this film ended, I went away feeling absolutely positive that network morning news shows and syndicated entertainment news programs are not giving enough attention to up and coming women directors. Not nearly. I've been a Melissa McCarthy fan ever since I saw her do a sparkling bit part in a 1999 crime comedy movie called GO. In GO, we see a Christmas season ecstasy drug sale go haywire for a financially desperate supermarket clerk in L.A. The young clerk trying to dodge being broke on Christmas was played by Sarah Polley. Polley went on to direct Best Actress Oscar winner Julie Christie to another Best Actress Oscar nomination for her performance in the 2006 drama, AWAY FROM HER. I've followed Melissa McCarthy from GO to her TV shows, her Oscar nominated performance in the comedy BRIDESMAIDS to other comedies after that. CAN YOU EVER FORGIVE ME? is a drama, a biopic focused on a critical time in a woman's life, and Melissa McCarthy is the star. 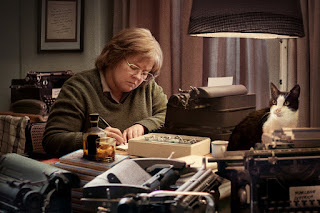 Director Marielle Heller draws a solid and believable performance from McCarthy as a miserable real-life character in a film that's good, entertaining and unpretentious. Melissa McCarthy plays a broke New York City author who assumes the identity of the Broadway star played by Barbra Streisand in FUNNY GIRL. Lee Israel committed forgery. She forged letters she claimed were written by late, great celebrities and sold them for top dollar. The story starts in 1991 in New York City. Had these forgeries been committed in the early 80s and had the movie been made in 1991, we probably would not have seen an actress as "Lee Israel" the real-life person. 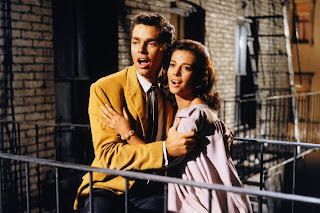 The actress may have played a tainted character based on Lee Israel so that Hollywood could have made her a heterosexual spinster who attracts a shy guy bookstore clerk instead of being a brainy, down on her luck lesbian author who drinks too much and avoids romantic relationships. Director Marielle Heller shows Lee Israel as she was. As someone who lived there for over 20 years, I can tell you that New York City is the original Island of Misfit Toys. Millions of us head there to be our real selves, reinvent ourselves and distinguish ourselves. Some make it with spectacular results. Even more do pretty well -- not great -- and work hard to keep working because they're just getting by. To friends and relatives back in our hometowns in other states, hearing that we're in TV or the theatre or the publishing business sounds impressive and fabulous. The reality of our job is not that glamorous and we're not exactly making "Oprah money." In the first scene, we see Lee Israel at a workplace desk. She's in bland clothing, she has a drab haircut and she's drinking on the job. She's criticized for that and gives the other office folks near her a major piece of her mind as she knocks back the rest of her drink. Then, we follow her to a Manhattan party thrown by her top literary agent. We immediately see that Lee is a handful for the agent to deal with. Lee's latest works have not been selling. She doesn't exactly play the game like other writers. She has a temper. She's so broke that she has to sell some of the books she owns for cash to pay for her cat's hospital bill. In an age where Madonna is considered a show biz genius of a superstar, Lee wants to write a biography of Fanny Brice. Lee won't play the game -- and she should. Her modest apartment is a mess. It's basically a restroom for her cat. Lee hates that talent and history now seem unimportant in the arts scene of the early 1990s. After feeling humiliated at her agent's party, it's here where CAN YOU EVER FORGIVE ME? takes on a dynamic similar to what we saw in TOOTSIE. Lee, the artist, storms into the office of her high-powered agent and confronts the agent with her unemployment woes and frustrations. Like George (Sydney Pollack) did to actor Michael Dorsey (Dustin Hoffman) in TOOTSIE, the agent verbally slaps the client in the face with some hard facts that the client is his/her own worst enemy. There must be a major attitude change. This inspires the artist to come up with a deception that will keep the desperate artist in money. Eventually, the ruse will lead to a true self and a real voice to emerge. Hollywood, for years, gave us the same image of lesbians. They were humorless and mannish. This film flips the script on that. Lee composes letters in the voice of the late, great wit Dorothy Parker. Her letters have a Parker-esque humor and she forges the signature. She does this with Noel Coward too. So the drab-looking lesbian Lee turned out to be one of the most shining wits at the agent's sophisticated party -- but her agent never realized it. Buyers believe Lee's cheeky and memorable letters were actually written by Dorothy Parker, Noel Coward and Fanny Brice. Lee makes enough money to get caught up with her bills, to afford food, to take care of her cat and to buy herself more drinks. She meets a flighty middle-aged gay man, still partying like he's 25, and he becomes her accomplice. Jack Hock is good for laughs and he eats up some loneliness in Lee's life but he's as responsible as an 8th grade boy with a blowtorch. Will Lee learn how to get out of her own way? McCarthy is very good at showing the intellectual trickster and the desperate loner behind it. She feels that, with her talent, things should've gone better for her. Heck...millions of us did in NYC. When Lee rants about author Tom Clancy, I laughed because I recognized myself behave the same way when I saw Billy Bush making millions on NBC with nowhere near the experience and TV resume I had while I was making $500 a week on New York City morning radio. Somehow you've got to move on. That's life on the Island of Misfit Toys. 1991 was not a long, long time ago but we see the story driven by something that seems to be a lost art today. Typed and/or handwritten letters that were sent in the mail. Correspondence that involved postage stamps. Now we're in the age of Twitter and Instagram. Letter writing was and is an art that needs to be resurrected. CAN YOU EVER FORGIVE ME? co-stars tall, lanky Richard E. Grant (WITHNAIL & I, L.A. STORY, GOSFORD PARK) as the irresponsible gay male pal who also needs to face some self-truths. If Tower Records still existed, I would've dashed to one right after the movie to buy a CD of the soundtrack. It's delicious. The CAN YOU EVER FORGIVE ME? soundtrack has selections by Blossom Dearie, Billie Holiday, Jeri Southern, Chet Baker and Marlene Dietrich. The two former con artists, Lee and Jack, have a meeting. Their lives have changed. As they come to terms with the reality of each other, Marlene Dietrich sings "Illusions" from Billy Wilder's A FOREIGN AFFAIR in the background. An inspired choice for that scene. 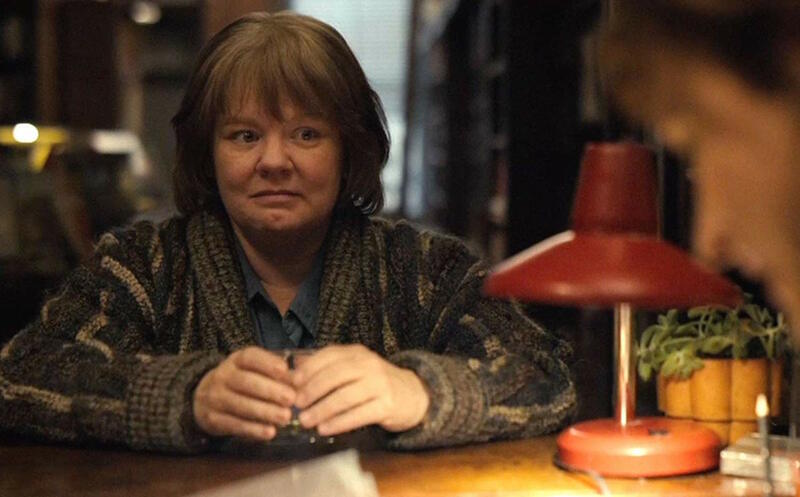 McCarthy impressively handles this dramatic material and commits to playing the ugly but totally human side of the character, the side that connects us to her. 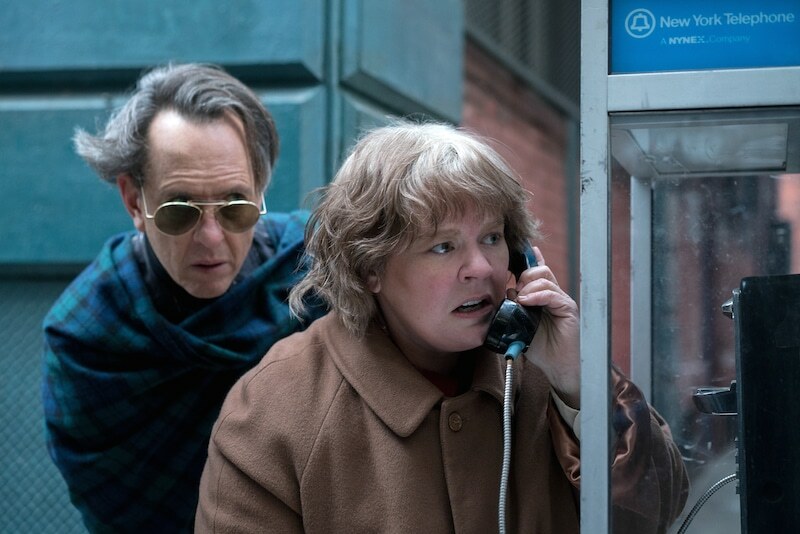 If you're a Melissa McCarthy fan, CAN YOU EVER FORGIVE ME? is worth a look. Melissa McCarthy received a Golden Globes nomination in the Best Actress category for this drama. Richard E. Grant got a Golden Globes nomination in the Best Supporting Actor category. No woman was nominated for a Golden Globe in the Best Director Motion Picture category. Again, I say that more attention needs to be given women directors. Some promising and excellent work from women is not getting the praise and support it deserves.